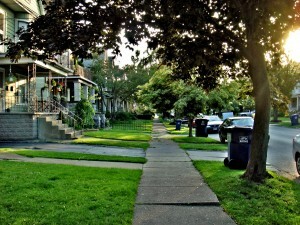 Exclusive neighborhood-based social network ‘Nextdoor’ on the rise in U.S.
More than 25 percent of American communities are using “Nextdoor,” the selective, stealthy social network that wants you to talk to your neighbors. Unlike Facebook, Twitter or Instagram, which are focused on letting users share their content across a vast social landscape, Nextdoor is designed to be small, insular and intimate. In 2012, Nextdoor began allowing people to sign up with a closed beta, amassing a userbase of over 3,500 neighborhoods across 48 states. A Nextdoor representative told the PBS NewsHour that it has been adopted in over 40,500 communities of 10 or more households as of Wednesday — more than one in four communities in the U.S. In an age where social networking giants have been collecting and using data from their users, users are offering up their names, detailed schedules and other personal information in exchange for Nextdoor’s offering of close-knit, real life connections. Local forums and e-mail lists currently account for the bulk of intra-neighborhood communication, according to Pew Research. A 2009 study exploring the relationship between new technologies and social isolation found that Americans’ discussion networks were decreasing in both size and level of diversity. Since its 2012 launch, Nextdoor’s overall growth has been steady, but not spread evenly across the country. By and large the network’s success in one community versus another depends on a number of variables. In particular, pre-existing communication networks and the physical layout of a neighborhood can either catalyze or halt Nextdoor’s adoption. These factors are further complicated by a neighborhood’s demographics. Nextdoor’s goal is to forge familiarity among its users, but at its core the service relies on a certain degree of tech-savviness, a barrier to entry that turns some away. In exchange for the data its users willingly contribute, Nextdoor neighbors are gaining insight into the goings on in their immediate living spaces. In addition to hyper-local crowdsourcing for things like babysitters or restaurant recommendations, Nextdoor has been used as a tip line for local authorities. While undoubtedly helpful, the aggregation of a community’s concerns about crime have left some users with a different perspective on their surroundings.